The bebop revolution of the 1940s led to major changes in the style and approach of rhythm sections and especially drummers. 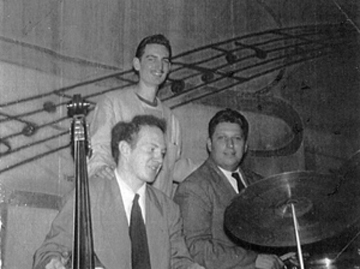 While the contributions of bop pioneers such as Kenny Clarke, Max Roach, Roy Haynes, Don Lamond, Ed Shaughnessy and Stan Levey during this period and later are legendary, the work of Norman “Tiny” Kahn (1924-1953) is less well-known due to his premature death from a heart attack at the age of only 29. 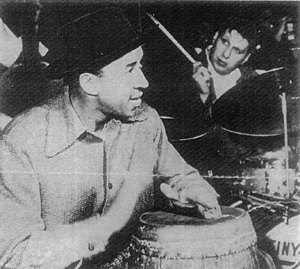 Kahn was a sensitive and swinging drummer who played and recorded with many of the modern jazz stars of the time including Lester Young, Wardell Gray, Stan Getz, Red Rodney, Al Cohn and Serge Chaloff. His big band credits include Charlie Barnet, Herbie Fields, Chubby Jackson, Boyd Raeburn and Elliott Lawrence. But Kahn was also an outstanding composer and arranger, very unusual talents for a drummer. His arrangements graced the books of Barnet, Jackson and Lawrence as well as that of Woody Herman. You will note in perusing Kahn’s discography some seminal recordings of the bebop era, the importance of which is reflected in the large number of reissues of many of the sessions. One can only imagine how the jazz world would have benefited had he been granted a longer period of productivity. An excellent article entitled “Remembering Tiny Kahn” by Burt Korall can be found in the April, 1991 issue of Modern Drummer Magazine. Tiny Kahn was remembered at the Los Angeles Jazz Institute festival “East Coast Sounds: Out of the Cool & Into the Hot” held May 27-30, 2010. Several of his big band arrangements were performed. Mel Lewis remembers Tiny Kahn in 1989. Thanks to Malcolm Walker, Bob McCaffery, Peter Friedman, Bill Damm, Jack Woker, Mark Cantor, Desne Ahlers, Bruno Leicht, Jeff Sultanoff, Don Sickler, Bob Sunenblick and Bill Gallagher for providing information on Kahn’s recordings and to Robert Kahn, Tiny’s cousin, whose initial contact inspired me to do this discography.